easy removal of the tire from the wheel and. when in place. it provides a seat for one side of the inflated tire. 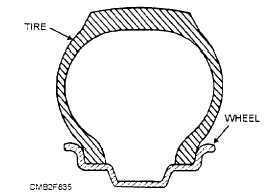 The drop center wheel (fig. 8-35) is made in one piece and is commonly used on passenger vehicles because it allows for easier installation and removal of the tire. Bead seats are tapered to match a corresponding taper on the beads of the tire. The semidrop center wheel (fig. 8-36) has a shallow well, tapered-head seat to fit the taper of the beads of the tire. It also has a demountable flange or side ring. which fits into a gutter on the outside of the rim. holding the tire in place. A safety wheel (fig. 8-37) is similar to the drop center wheel. The major difference is that the safety wheel has a slight hump at the edge of the bead ledge that holds the bead in place when the tire goes flat. A split wheel (rim) (fig. 8-38) has a removable bead seat on one side of the rim. The seat is split to allow for its removal so tires can be easily changed. Some bead seats also require the use of a lock ring to retain the seat. These wheels are used on large commerical and military vehicles. Lug nuts hold the wheel and tire assembly on the vehicle. They fasten onto special studs. The inner face of the lug nut is tapered to help center the wheel on the hub. Lug studs are special studs that accept the lug nuts. The studs are pressed through the back of the hub or axle flange. A few vehicles use lug bolts instead of nuts. The bolts screw into threaded holes in the hub or axle flange. Normally, the lug nuts and studs have right-hand threads (turn clockwise to tighten). 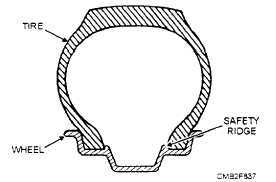 When left-hand threads are used, the nut or stud will be marker with an "L." Metric threads will be identified with the letter M or the word Metric. Figure 8-35. - Drop center wheel. Figure 8-37. - Safety wheel. Figure 8-36. - Semidrop center wheel.